Crest Ridge Saddlery makes saddle pads, tack and a range of accessories that compliment your Crest Ridge saddle. Saddle pads are on this page. For everything else, click on the links below to open the appropriate page of our on-line store. Available leather colors are shown to the right. Each piece of leather is unique and color variations will sometimes occur. Crest Ridge Saddle Pad Crest Ridge Saddlery makes our own line of premium wool felt saddle pads. Our saddle pads are made from F11 grade industrial pressed wool - a 100% natural product that will wick moisture and heat away from your horse keeping you horse more comfortable while reducing saddle movement. These custom made pads feature a cut-out to provide additional clearance over the spine and are only available from Crest Ridge Saddlery. The Crest Ridge Saddle Pad is durable, designed to last for 2,000 hours of hard riding. If you are riding 5-hours a week, this pad will last over 7 years. The Crest Ridge Saddle Pad is likely the last pad you will have to purchase for your horse or mule. You can go to the ordering page by clicking on the size and color of pad you desire. Our saddle pads are offered with black or show brown wear leathers which you select on the ordering page. The Crest Ridge Saddle Pad is a premium saddle pad designed for use with a single horse over time. Have you ever seen a hatter clean and reshape a black felt cowboy hat? He does it with steam. When we place a well fitted saddle on your horse’s back, a 100% wool felt pad, and use that same pad on that same horse with the same saddle within 4 or 5 rides the horses’ body heat starts to mold that pad to a perfect fit. If there is a place that is a bit tight, or if your horse is a bit asymmetrical, within a few rides this pad molds itself to a perfect shape. 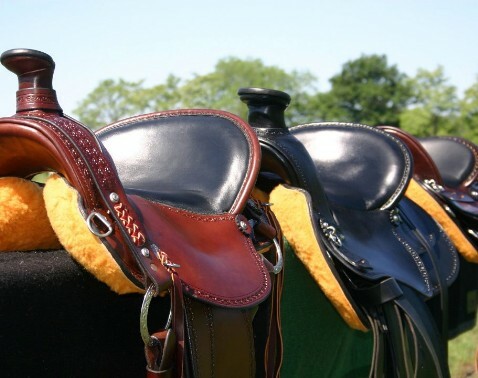 If you have a horse that is out of condition and you know that he will change shape as you put the miles on him, Crest Ridge Saddle Pads will change with him. The felt is shaped the same steam that the hatter uses, only this time the steam machine is your horse. Cheaper wool felt pads on the market are made of needled felt which pad cannot compress. Crest Ridge Saddle Pads are offered in 1/2" (gray only), 3/4" and 1" thicknesses. All our saddle pads are 27.5" long (front to back along the spine) and 30.5 inches wide (not including the wear leathers). We offer each pad in grey (natural) and black. The black pads are a bit more expensive to account for the extra step of dying the wool.